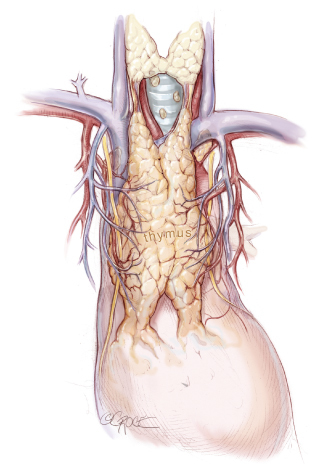 The thymus gland is an organ in the upper chest that forms part of the body’s immune system. In early life, the thymus is very active in producing immune cells but its function is gradually taken over by other immune tissues in the body so that by adulthood, it is much smaller or even replaced by fat. If cells within the thymus multiply in a disorganized manner, a tumor known as a thymoma may develop. Thymomas are usually benign but may become malignant and spread to other organs such as the lungs. It is not known what causes these tumors to develop, but they are associated with various conditions including myasthenia gravis, where the immune system mounts an attack on various muscles in the body. At least 30% of individuals with a thymoma will also have myasthenia gravis. Patients with a thymoma may be asymptomatic or may present with symptoms such as chest pain, difficulty breathing or a persistent cough. Once identified by imaging studies or biopsy, treatment usually involves surgery and may also involve radiation therapy to reduce the likelihood of tumor recurrence. Up to half of individuals with a thymoma do not experience any symptoms. Symptoms that may occur usually result from compression of surrounding structures. These symptoms may include chest pain or discomfort, difficulties with breathing and swallowing, a persistent cough and hoarseness of voice. In addition, symptoms of myasthenia gravis may be present such as muscle weakness, which typically worsens with repeated muscle use and improves with rest. In the rare cases of a malignant tumor, individuals may also experience fever, night sweats and weight loss. For patients where a thymoma is suspected based on their symptoms or an established diagnosis of myasthenia gravis, imaging studies of the chest are performed. These include chest X-rays as well as computed tomography (CT) scans of the chest, which provide further detail on the tumor in order to guide its surgical removal. In some cases, a preoperative biopsy of the suspected tumor may be carried out. Treatment of a thymoma generally involves surgical removal of the thymus gland. This may be carried out by open surgery or minimally invasive methods such as videoassisted or robotic techniques. These minimally invasive techniques may result in less pain and bleeding as well as a shorter length of stay in hospital compared to open surgery. Additional treatment depends on the extent to which the thymoma has spread to surrounding tissues, which is known as the stage of the tumor. While most cases are benign and require only surgical intervention, invasive tumors usually require postoperative radiotherapy as well in order to reduce the chance of tumor recurrence. Tumors that have spread to the lungs and heart may require chemotherapy in addition to surgery and radiotherapy. In most cases of thymoma, appropriate intervention results in a high survival rate. As always, the risks should be weighed against the benefits and discussed with your surgeon.